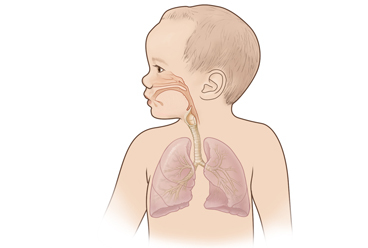 When a newborn has respiratory problems, it means that the baby is having trouble breathing. If your baby was born early, the lungs may not be not strong enough to do the work they are supposed to do. Or a breathing problem might be caused by an infection, such as pneumonia. Or your baby may just need a little extra time getting used to life outside the uterus. The doctor and nurses will do tests and watch your baby closely to find the cause of the problem. Your baby may get oxygen to help with breathing. It is given to the baby through a tube in the nose or throat. The doctor may use a ventilator. This machine helps your baby breathe. To use the machine, the doctor puts a soft tube through your baby's mouth into the windpipe. Often the best treatment is time. Your baby's breathing problems may go away within hours as the lungs begin to work as they should. It may seem that your baby is getting lots of tests. All of these tests help your doctor keep track of your baby's condition and give the best treatment possible. The hospital staff will give your baby the nutrition he or she needs. The doctor may feed your baby through a soft tube that goes through the nose and into the stomach. Or the doctor may use an IV that goes through the belly button to do this. Your baby will be kept comfortable and warm. Enter S621 in the search box to learn more about "Learning About Respiratory Problems in Newborns".